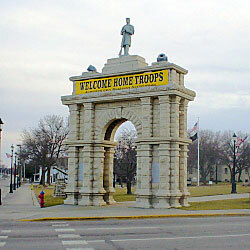 Description: The Memorial Arch has a height of thirty-five feet, base of twenty-three feet; each pier is seven feet six inches square, and the arch eight feet wide and sixteen feet to the keystone. The center of the arch has the carved date 1898. Inscriptions on the left front of the arch read: "In God We Trust ~ In Memory ~ Of ~ The Soldiers And Sailors Of ~ 1861-1865 ~ Who, Inspired By Patriotism ~ Freely Offered Their Lives ~ For The Maintenance Of ~ An United Country". Inscriptions on the right side of the arch read: "1861-1865 ~ Total Enlistment ~ 2,778,304 ~ Killed in Battle ~ 67,050 ~ Died of Wound Received in Action ~ 43,012 ~ Died from Other Causes ~ 240,458". Two 8-inch Siege and Garrison Mortars are mounted on the top of the arch. 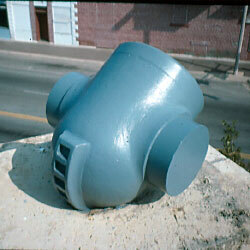 A white bronze (zinc) soldier is also mounted.